This article originally appeared in The Yachting Monthly in February 1939. You can access a copy of the original article here. Sail area …………………….1,020 sq. ft. MANY experienced cruising yachtsmen have a preference for the yawl rig, despite the contention that it is not so close-winded as the cutter. But many assert that a yawl sailing with the mizzen stowed is more comfortable in a hard breeze than a cutter of the same size with the main- sail reefed down. A fine example of the modern fast cruiser of this type is now under construction by A . H . Moody & Son, Swanwick Shore, near Southampton, to designs by Fredk. Shepherd, M.I.N.A., for Major E. S. Harston, of Wyndham Place, London, W.1. The owner required a speedy vessel having the maximum possible accommodation in a 50-footer, and suitable for both cruising and handicap or ocean racing on occasion. The plans, which are reproduced, should satisfy these conditions very well. The lines are sweet and easy and promise plenty of pace. Although not based on the metacentric shelf system, the hull has in fact an almost straight and excellent shelf, and in profile the yacht is undeniably a good-looker. The overall length is 50 ft. 9 in., the water- line length is 38 ft., the beam 12 ft., and the draught 7 ft., working sail area 1,020 sq. ft.
Now in process of being framed up, the hull is constructed of 1¼ in. pitch pine on grown oak frames, spaced 21 in. centres, with one bent timber of American elm between each pair of frames. The decks and the deck fittings are of Burma teak, and the interior woodwork will be carried out in light waxed oak. Delivery is to be at the end of April. Installed below the floor of the bridge deck is a 4 cylinder 12-36 h.p. Gray petrol motor fitted with 2 to 1 reduction gear, and accessible by means of a flush hatch in the floor of the deck shelter. Ventilation of the engine space is arranged by means of cowl type inlet and mushroom type extractor vents, and two fuel tanks, each of 20 gallons capacity, are located under the side decks aft. The fresh water supply of 120 gallons is carried in two inter-connected tanks below the cabin flooring amidships. 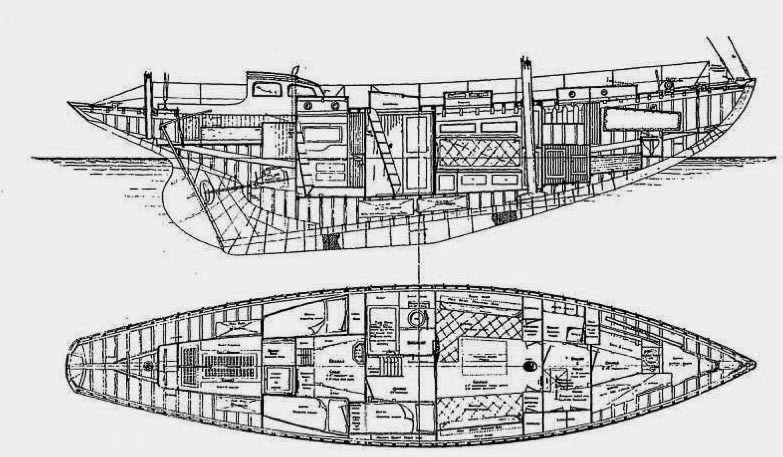 Below decks her accommodation is planned for space and comfort. Tiller steering and the position of the 12-36 h.p. Gray motor, tucked well aft under a bridge deck, are points to be noted. There is 6 ft. 1 in. headroom throughout the accommodation, inclusive of the fo’c’sle, where there is one built-in and one folding cot berth, and a concealed lavatory for the crew. A spacious galley, equipped with an Electrolux refrigerator, is placed between the fo’c’sle and the saloon, which, in addition to the settees, has Pullman type beds. A sliding door at the after end of the saloon leads to a wide lobby, having a bathroom and lavatory on its port side and a single berth on the opposite side. On the starboard side of this lobby is the entrance to a large and comfortably fitted double-berth cabin having an emergency exit to the bridge deck. The Bermudian yawl rig appears to be well balanced and well stayed, and should be easily handled. 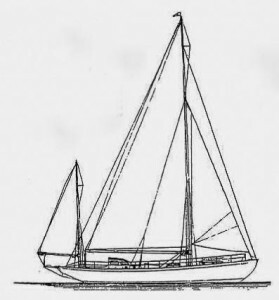 The mainmast is a hollow spar 60 ft. in height above the deck, and the solid mizen mast has a height of 26 ft. Roller reefing is provided for the main boom, and there is a double detachable forestay. As 1939 is a Fastnet year, it is permissible to hope that Major Harston may be able to enter his new yacht for our foremost ocean racing event. 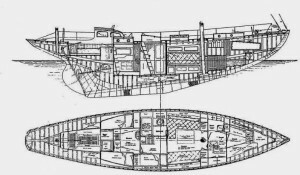 A fairly heavy displacement, with easy lines, promise a seakindly hull. LOA 50.75 ft. LWL 38 ft. Draught 7 ft.